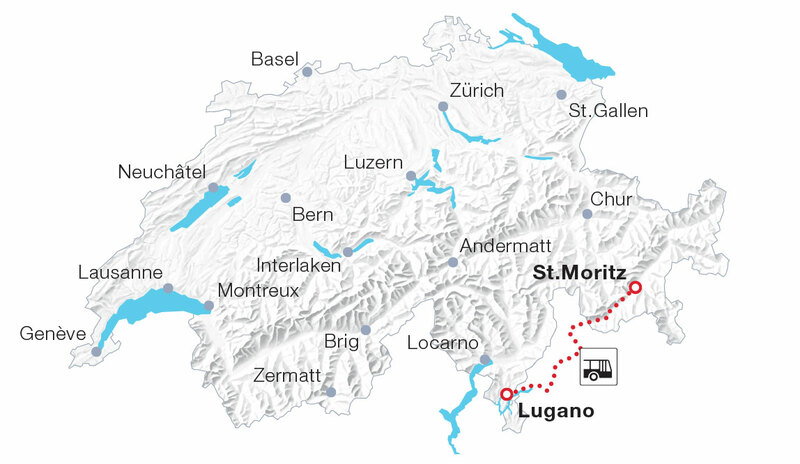 From the impressive glaciers of Engadin to the lovely palm trees of Lugano: The Palm Express invites visitors to a pleasantly diverse four-hour PostBus journey. After leading over the Maloja pass, the road winds down to the Val Bregaglia. At astasegna, travellers cross the Swiss-Italian border and little later arrive at the charming Italian town of Chiavenna. The journey’s final destination is Lugano, city of Mediterranean flair and one of Ticino’s main urban areas. No catering services on the Postbus.